Why is the 138 combat calculation such a bad idea? Read more to learn why. Did you know that poking around the foundation of the of the old combat scaling system reveals massive imperfections in the heart of the calculation? For example, did you know that the old combat system would skew the strength towards a combat class, leaving an uneven matchup in combat prowess that would plague players for years? Do you even know what the purpose of the combat calculation is? The reason for this editorial is the most recent "dragonstone" poll. For those who have not kept up with the recent poll news, there is a poll out letting players vote for either a 138 combat level calculation (the same one that existed before EOC) and the current 200 combat level calculation. When I heard the news, I cried. No, I’m serious. I ran up to my room, put my head in my pillow, and wept at the loss of my innocence that I first found while reading Anne of Green Gables. Okay, I didn’t cry. But I was pretty mad. I knew the 138 combat calculation would win and so far I am right. Currently, on the morning of February 15th EST, the 138 combat calculation is winning, 71% to 29%. The worst part is that it’s winning for all of the wrong reasons. Reason being is that every way you look at it the current system is better than the old one. To find the reasons as to why this is, we need to go back to the beginnings of Runescape. As most of you know, Runescape began as quite a different game than it is today. A blend of 2d and 3d graphics, relatively slow movement speed, and a different combat system. 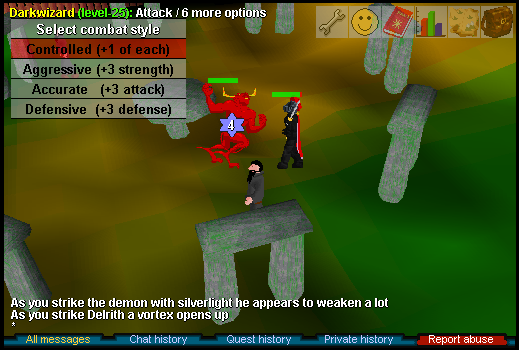 When players today think of the Runescape classic combat system, they generally think of the three hit combat system. This means that you must take three hits from your opponent before you can retreat, as opposed to Runescape 2 or 3 where you can run away whenever you’d like. However, the differences in combat lie farther than three hit combat. In the original game, melee was the primary form of combat. This was because all of the other combat styles, magic and ranged, were generally underdeveloped. Ranged was completely underdeveloped; there was little in the form of range armor and ranged was rarely used in a PvP sense. Magic had similar drawbacks. When a player failed to cast a spell, the player had to wait 20 seconds before he/she could cast it again. Magic was also tough to train; the lack of the Runecrafting skill made runes expensive. Although magic gained some more credence when the god spells came out, magic for the most part was nothing more than a complement to melee. Understandably, in Runescape Classic Attack and Strength were favored more into the combat calculation than Ranged and Magic. In Runescape Classic, the maximum combat level was 123. When the change to Runescape 2 was made, little was done to alter the combat calculation. Prayer was given more of a factor into the calculation, thus the maximum combat level raised to 126. Magic and ranged were not favored more or less in the calculation. However, in the actual combat system they were. Magic and ranged became their own distinct class. With the release of updates from the spring of 2004 to the spring of 2005, magic and ranged were given high tier armours, new attack options (i.e. the Ancient Magicks Spell Book), a protect from melee prayer, better access to arrows and runes, and much more. This increased the power of these classes and they arguably became on par with the melee class. However, the calculation remained the same. This allowed for a maxed ranged or magic player (let’s say with 99 Defense and 99 Ranged/Maged) to be level 100-110, while and maxed melee player to be around level 120. (These numbers are estimates of course, as they don’t take into account prayer or hitpoints). This would allow Ranged or Magic players to have a significant advantage over Melee players in PvP settings. Now we skip eight or so years and move to the Evolution of Combat update. The update rebalances the combat triangle. Now the three combat classes are no longer “arguably equal;” they are undeniably balanced. With this, the Jagex developers decided to ditch the 138 formula (the maximum combat level increased from 126 to 138 with the release of Summoning) and install the current/past (depending on how far into the future you read this) combat formula. The 200 formula treats the classes as equal. For instance, a player with 99 Ranged and 99 Defence would have the same combat level as a player with 99 Magic and 99 Defence. Problem fixed, right? Pretty much. The 200 system is not perfect (the biggest issue with it is that prayer is not taken into account) however it trumps the previous system in scaling players. However, the 200 calculation had something going against it that it simply cannot dodge – nostalgia. The poll responses have largely been fueled by nostalgia. 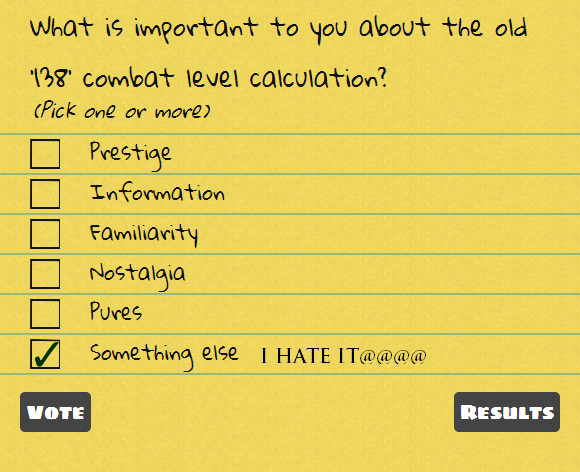 Players grew up with a certain combat calculations and want to see it continued. However, nostalgia is never a good reason to implement anything. There are other reasons for voting for the 138 that aren’t directly nostalgia related. One is familiarity, which I find odd considering the 200 calculation has been in the game for well over a year now. The next is pures, which makes little sense. Pures were not ruined because of the combat scaling system but because they could not wear the hitpoint boosting armour their high defence opponents had. The final is that it will give maxed combat more prestige. While this is true, a combat level is not meant to be an indicator of how hard someone has worked on their account. It is an indicator of account strength. The 138 system would not only fail to do that well in the new combat system, it failed to do it in the past combat system. That's probably why "It scales players well" is not an option on the RSOF topic where players discuss what they like about the 138 calculation. Not only is the 200 formula scale players well, it is pretty simple to calculate. If you gain another defence level for instance, you are going to know what combat level you will be. Also, by looking at another’s combat level, you should be able to figure out the ballpark of the player’s stats. After you take all of the above into account, I am not sure how you could argue that the 138 combat calculation does a better job at what is is supposed to do than the 200 calculation, especially in the current EOC system. At the end of this editorial, it is important to note something important. When/if the 138 calculation wins, Jagex will create another poll, giving players the option to change the 138 calculation. This possibly could prevent the issue discussed above. The system however would have to be changed drastically. Hitpoints would have to have very little effect on the calculation and Attack and Strength would have to be scaled to Ranged and Magic. Will this poll to change the combat system succeed in solving the issue? We don't know, but probably not. As stated before, nostalgia plays a large role in people's decisions. They want the old calculation back, not an entirely new one. Even if the players voted yes to a change, we would not have that much influence in what gets changed and what does not. This takes some power out of the players' hands. Not that I mind that. It is the reason we are here in the first place. Agree of disagree with me? Check out my forum topic here and we can have a argument discussion.